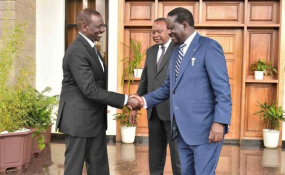 Nairobi — The African Union Commission on Saturday announced the appointment Kenya's Opposition leader Raila Odinga as High Representative for Infrastructure Development in Africa. In a statement, Chairperson Moussa Mahamat said Odinga - who served as Prime Minister and also Cabinet Minister in charge of Energy (during retired President Moi's administration), Roads, Housing and Public Works dockets (during ex-President Mwai Kibaki first term) - will work to support and strengthen the efforts of the Commission's relevant departments. He is also tasked with mobilising further political support from member states, regional economic communities and facilitating greater ownership by all concerned stakeholders on the continent. Odinga announced during the Mashujaa Day fete Saturday in Kakamega that he had accepted the appointment. President Uhuru Kenyatta congratulated Odinga on his appointment noting that under his leadership, several key infrastructure projects were conceived and successfully implemented among them by-passes in Nairobi and other major towns across the country. "The appointment of Raila Odinga to the High Representative position is a great honour not only to the Hon. Raila but also to the people and the Republic of Kenya." He pointed out that Odinga has over the years been at the forefront in the development of modern infrastructure as an economic enabler and as an instrument for regional and international integration. "We all fondly remember the Hon. Raila Odinga for the exemplary infrastructure development work he did in his past assignments in Government as Minister for Roads and Public Works, and as Prime Minister in the Grand Coalition Government," read a statement from State House. In the discharge of his mandate, the Opposition leader will pay particular attention to the missing links along the transnational highway corridors identified as part of the Trans-African Highways Network, with a view to facilitating their development and modernization.